Tony Madlock will make his debut as interim head coach of the Rebels Tuesday night when Ole Miss takes on Missouri (8:00 p.m. CT, ESPN2) on the road. Madlock takes over for former head coach Andy Kennedy who stepped down Sunday, effective immediately. 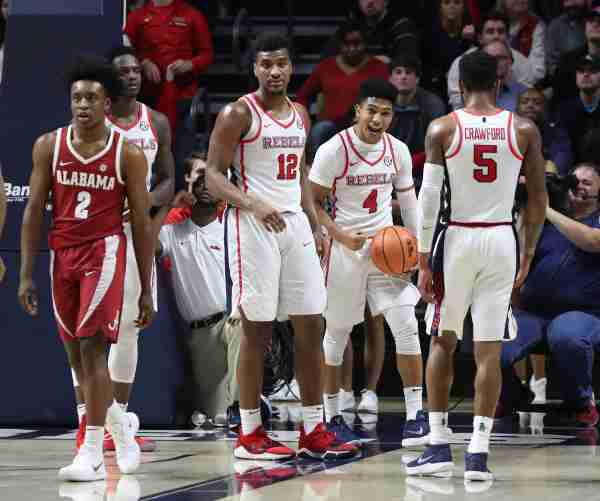 Though this season has not been what the team or fans expected, the Rebels still have basketball games left to play, and they’ll have to prepare for a Tigers team that’s coming off a 64-63 road loss at LSU. Despite the loss, Missouri has played well, winning five of its last six games by at least four points. The Tigers (18-9, 8-6) have been winning without their star freshman Michael Porter Jr., who suffered a back injury in just two minutes of the team’s 74-59 season-opening win over Iowa State. Rumors have been swirling around the program that Porter could return this season for Missouri, but nothing is in concrete as of right now. Without Porter, senior guard Kassius Robertson has been pacing the Tigers on offense, averaging 16.5 points per game. He also leads the team in steals (28). Robertson leads the SEC in playing time, averaging 35.6 minutes per game, and ranks second in the conference with 3.0 3-pointers made per contest. Forward Jordan Barnett is another senior who has played well for Missouri as he’s averaging 13.9 points per game. Freshman Jontay Porter leads the Tigers in blocks (51) and averages 8.9 points per game. Missouri is one of the best in the league when it comes to rebounding defense, allowing just 32.4 boards per game. The Tigers are also shooting 38.3 percent from 3, which ranks second in the SEC to go along with their 3-point field goal percentage defense (31.0). Missouri won the first meeting this season against Ole Miss, defeating the Rebels 75-69. Ole Miss had a difficult time stopping Robertson as he scored a game-high 27 points on 8 of 16 shooting, including going 5 of 9 from deep. As a team, the Tigers made 10 of 23 shots from beyond the arc and recorded 16 assists on 24 made field goals. Missouri controlled the glass as well, holding a 39-34 advantage over Ole Miss. 1. How will this Ole Miss team play under Madlock? With Andy Kennedy officially gone, how will Ole Miss respond under its interim coach Tony Madlock? It will be interesting to see if this team can, somehow, gel together under Madlock’s watch with four regular season games left. The Rebels haven’t won a game since Jan. 23. Kassius Robertson, 6-foot-3, 180-pounds, has been a tough matchup this season for opposing teams. Missouri’s offense runs smoothly when he’s on the floor, and Ole Miss will have to find a way to slow him down and prevent another 20-point performance from the Toronto, Ontario native. Outside of his 16.5 scoring average, Robertson is also averaging 2.9 rebounds and 2.4 assists per game. The Rebels got away from making the right pass in their last two games. Against the Tigers, Ole Miss recorded 19 assists on 26 made field goals. The Rebels will need to make smart passes in order to defeat the Tigers.